Mary’s Court, a foundation created by hall of famer and FIU basketball coach Isiah Thomas and his wife, donated $50,000 to the First Generation Scholarship Fund. The check presentation was made during halftime this evening at “LeBron James, Dwyane Wade, and Chris Bosh present the South Florida All-Star Classic” sponsored by 1-800-411-PAIN. 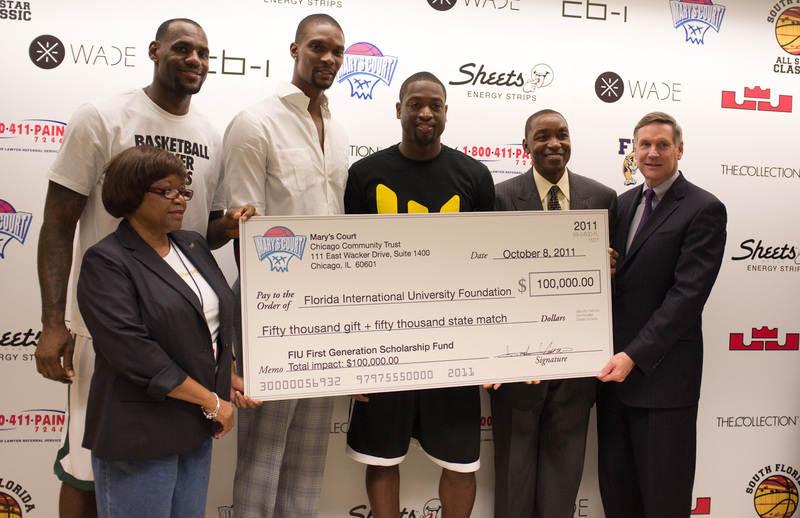 The charity game, organized by the NBA stars to benefit Mary’s Court, was held at the U.S. Century Bank Arena on FIU’s Modesto Maidique Campus. The First Generation Scholarship program was created by the Florida Legislature in 2006 and is the only program of its kind in Florida to match private donations 100 percent. Therefore, Thomas’ $50,000 donation will have a total impact of $100,000 in scholarships. Approximately 40 percent of FIU students will be the first generation in their family to attain a college degree. The majority of these students meet eligibility requirements for a First Gen Scholarship. But getting an award remains elusive for many FIU students because demand exceeds funds. During the 2010-11 academic year for example, approximately 9,000 First Generation-eligible students did not receive scholarship support. This fall, about 600 students received a scholarship. For FIU student Tresha Thompson, who grew up in a poor town in Jamaica before moving to Miami when she was 10 years old, the scholarship represents a step forward in achieving her dream of a college education. Thompson was joined by FIU Vice President for Student Affairs Rosa Jones in accepting check. Since the scholarship’s inception, the university has raised more than $3 million for first-generation students. For more information or to make a donation to the First Generation Scholarship Fund, click here. Building upon a history of community engagement and philanthropic support of education, 1-800-411-PAIN contributed to making the First Generation donation possible. “1-800-411-PAIN is proud to continue our commitment to education by supporting Isiah Thomas and his Mary’s Court Foundation,” said company owner Robert Lewin.